See the link below portraying some of the fun everyone had during the Youth Festival that took place in the small Griqua community of Kranshoek near Plettenberg Bay on 15 and 16 June 2018, the annual Youth Day in South Africa. We are looking forward to continue to work with these stunning young people and youth leaders over the next couple of weeks and into the future. The Footsteps Foundation is planning a follow-up “Youth Focus 2018 Winter School” to take place during the winter school holidays. All participants will also be profiled to determine their aptitude to various types of careers, interests, passions, and to help guide the realisation of their dreams for their future. The Winter School will take place over two days, including a wide range of developmental and fun events ranging from talks by experts on topics that are current and relevant to issues young people are battling with, sports events and cultural workshops and competitions. Cultural workshops will include dance, drama, music, singing, film and poetry/story writing, and many more surprises….. The Footsteps Foundation is working closely with the current and future small business owners of Kranshoek, to create a sense of self-sustainability, pride and growth. During our workshops we are listening to people’s dreams for the future, and helping them to turn these into viable, sustainable, and profitable businesses. A great sense of excitement is created as we are connecting businesses with the market possibilities out there, following a step by step process of empowerment and ownership – not only of their business ideas, but also of their environment and their broader responsibility of their young people futures. 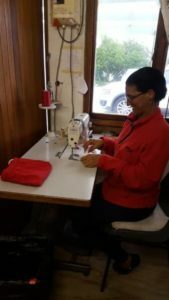 Yolanda Johnson, a local dressmaker from Kranshoek, and upcoming community leader, has a passion for the young people, not only of the Griqua community of Kranshoek, but also the very poor communities in De Aar. She has taken it upon herself to raise funds for enabling 16 Griqua youths from De Aar to make the annual pilgrimage to Ratelgat. 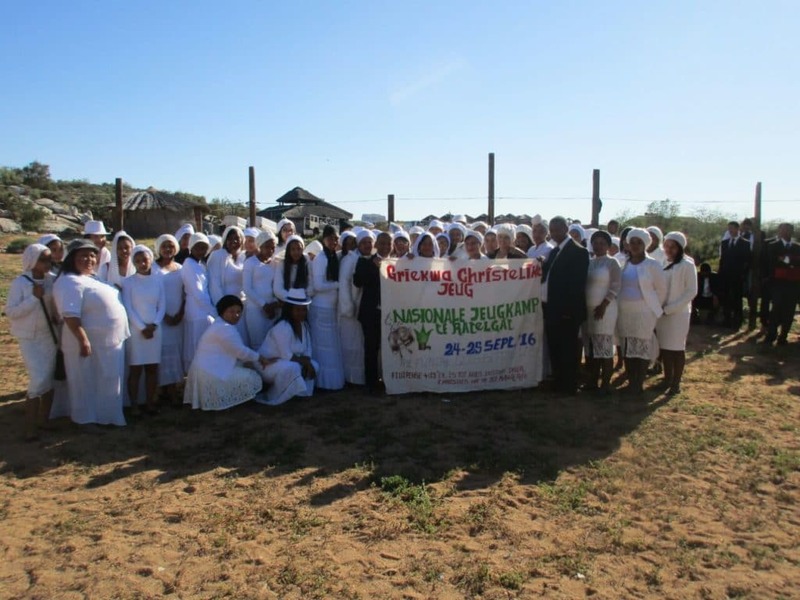 Read more about the annual Ratelgat event on the Jumpstarter Crowdfunding platform which was used to raise awareness about the Griqua pilgrimage traditions and to help make this journey happen for these young people. Watch out for this event in 2019. On 10 June 2017, the people from Kranshoek, a local settlement, whom were also severely affected asked for help to move their horses and life stock, to another area where they would be safer from the roads as fences were destroyed, plus they had no grazing. The community is still battling to rebuild part much of what was lost in the fires, including homes, fences and grazing fields. Lee Naude, the champion behind these initiatives, and activist for horses and their communities in South Africa, is a well-known personality in horse circles in South Africa and co-founder of EquineSA. Lee now resides in Kranshoek, and is making excellent progress with developing young people who not only care for their horses, but have also learnt to participate in show jumping events. Lee has been working fervently and non-stop with very little funds, with only the help of the community and well-doers, mostly local horse owners in the area, often in crisis mode, for the survival of the community and its horses. Her long term vision and passion is to improve the conditions of both the Kranshoek horses and the Kranshoek community. 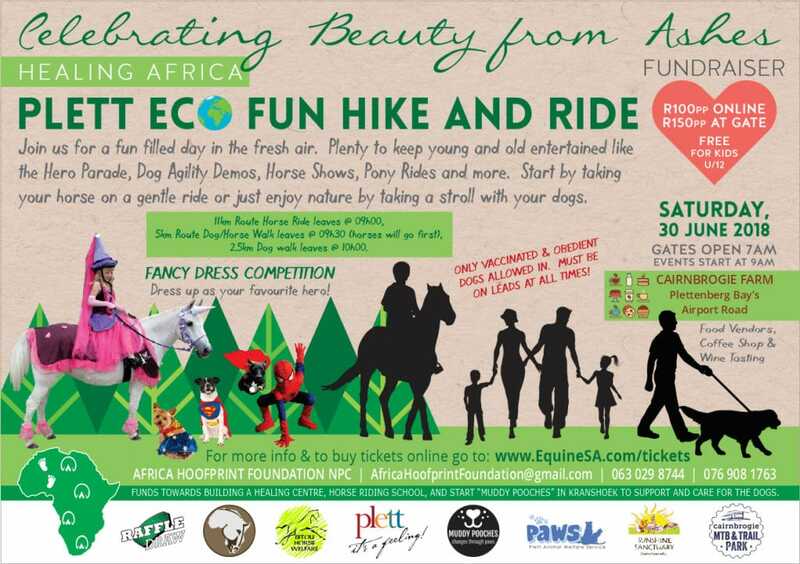 With the help of the Footsteps Foundation, Lee founded the Africa Hoofprint Foundation NPC, which is co-hosting an event with EquineSA on Saturday 30 June 2018, Celebrating Beauty from Ashes, Healing Africa, through a Plett Eco Fun Hike and Ride. “Volunteers arranged transport and we moved 7 of the horses to Stonefield Polo & Equestrian Centre. A couple of weeks later we moved another 2 horses to where we could care for them. We were astonished by the lack of knowledge and resources available to these horses and their owners. We decided to offer the owners of the horses in our care, some training, and assistance to help the horses, as their handling were not in a humane manner. We started with some basic theory training at my house and on the second session, when I wanted to get to know the horses through some basic horsemanship and groundwork, I noticed that the horses were severely traumatised when handled and some of them became aggressive when their people approached. Not one of them were comfortable with people, they took to fight, flight or freeze mode as soon as people approached them. We decided to stop all interaction with them and we are currently rehabilitating them, restoring trust and confidence. See The Story of the Griqua Re-visited. The vision is to restore dignity to the horses and their people, especially at-risk Youth, to reset the balance between human and nature in an area where horses were and could be again, a huge part of their future, not only as transportation, but as healing components, farm work, and sport, but also as part of building their economy with a positive carbon footprint (hoofprint), and open up the equestrian world, previously perceived as elitist, along with its possibilities for careers, employment, sport and sustainable green living. The projects are using the Jumpstarter Crowdfunding platform, to attract funding and support from the broader local and global community, for people to access an opportunity to make a difference to these people and their horses, providing an opportunity to provide support through either funding or direct participation and personal involvement.